We partner with the Alameda County Community Food Bank (ACCFB) to bring nutrition education and support to our Wellness Center guests. Staff from ACCFB and the Wellness Center work together to provide classes and workshops in these areas: cooking demonstrations, nutrition basics, healthy eating on a budget, and information on obtaining CalFresh (formerly food stamp) benefits. 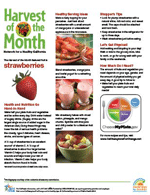 Every month we will feature recipes for a healthy food, this month our featured food is Strawberries! Check out the recipes on the right side of the page for innovative ways to prepare them. The recipes are available in English and Spanish, click the appropriate button to view and/or print the recipe in your preferred language. Check back here each month for a new featured healthy food, and recipes for your family! Watch out for nutrition and cookery classes. © 2014-16. Big Heart Wellness Center, Livermore, CA. All rights reserved.